(TMU) — Finally, a positive online “challenge” has gone viral! For years, bored teens and online spotlight-seekers have followed silly and sometimes dangerous trends, from the Birdbox challenge to the Tide Pod challenge. 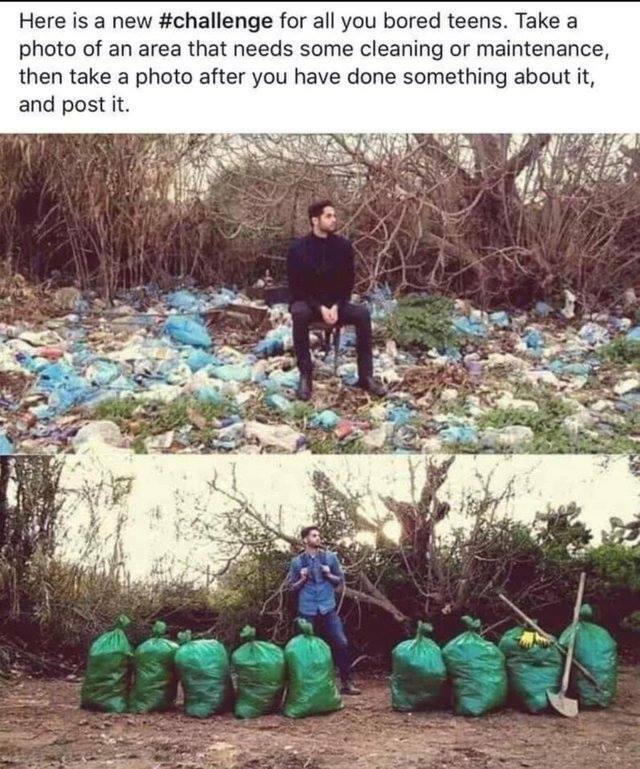 However, the idea of using a viral trend to motivate people for good could be an extremely positive force in the world, and the new #trashtag challenge is a perfect example. The hashtag was first seen in a 2015 post by the media brand Teton Gravity Research. “Help us all […] by joining the #trashtag project and posting pics of your own clean up efforts on Instagram. We aim to make a tangible impact on the environment through the galvanizing forces of social media,” the company wrote. Unfortunately, like most attempts to create viral trends, the hashtag never caught on and faded away into obscurity. Luckily, years later, an old photo somehow managed to pick up steam and spread across social media. The photo below appears to be what sparked the spread of the trend. It can be traced back to a Reddit post in the Wholesome Memes sub-reddit, but it is not clear where the image originated. The trend quickly spread across Twitter and Instagram, to users in many different corners of the world! Hopefully, the success of this challenge will inspire other positive viral trends in the future. For far too long, viral trends have brought out the worst in us, but the #trashtag challenge is proof that they can bring out the best in us too. This post is published to LBRY blockchain at lbry://@AntiMedia/viral-trashtag-challenge.